This past Monday, TNACI got to start the next phase of our Colvard Spring restoration project with new help! The conservation department at the Atlanta Botanical Garden has been growing the endangered Tennessee yellow-eyed grass (Xyris tennesseensis) to restore it in springs in the Southeast. We’re incredibly thrilled to have them join our team so we can continue returning this spring to a more natural state. Because we don’t yet know what “microhabitat” the grass will grow best in, we planted over 500 plants in soil ranging from muddy to pebbly. Our next steps will be to tackle the invasive plant species problem in the area and to create a management plan for the coldwater darter population. 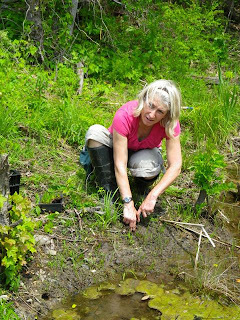 Dr. Jenny Cruse-Sanders, Director of Conservation and Research at the Atlanta Botanical Garden, plants Tennessee yellow-eyed grass along the banks of the spring. To see more photos from our day, “like” the Tennessee Aquarium Conservation Institute on Facebook!